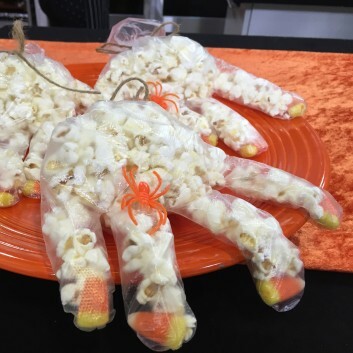 Try these awesome “witch’s hands” at your next kid’s party. You can’t beat the combination of fiber-rich fingers (AKA popcorn) and sugary-sweet fingernails (AKA candy corn). Festive, yet wholesome. Score! Add 1 piece of candy corn to each of the fingers of the glove. Then, fill the rest with air-popped popcorn. Tie the glove off with a twisty tie.